How’s the RV water pressure? Too little? TOO MUCH!?! If you’re not using a water pressure regulator on your fresh water supply line…add one immediately! Many an RVer has learned the hard way about blown water lines inside their rig that were caused by too much water pressure entering the rigs water supply system. 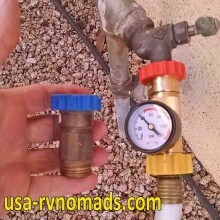 RVs are generally rated to handle 30-45 psi but the faucet which you connect to could spike much higher. I’ve seen some that have reached 60 psi. I recently replaced our regulator with one that has a pressure gauge so I can monitor what the supply pressure is at the source. You do have to replace these water regulators from time to time especially if you’re in areas where there is hard water. Calcium and other minerals will build up inside the regulator causing low volume and low pressure situations. Also, check and replace the inlet screens inside the hose ends, regulator and filters. This will help keep the water flowing freely. Prices range from about $20 (fixed pressure setting) all the way up to $100+ (fully adjustable). 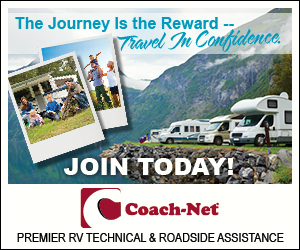 Its money well spent, considering the cost of water damage repairs (including the potential of mold mitigation), parts and labor to fix busted water lines buried deep inside your RV. To learn more about how we connect our water supply visit: Water Hookup.